Home » 1. FC Köln , Allianz Arena , Bayern Munich , Bundesliga , Hannover 96 , Mainz , mario gotze , Robert Lewandowski , SC Paderborn , thomas muller » Who Are SC Paderborn? The side at top of the Bundesliga were taken down to size by reigning champions Bayern Munich today, by a score of 4-0, but the former league leaders weren't Bayern’s rivals Dortmund, or even Schalke for that matter. The club at the top of the table going into today’s matches was a small, newly promoted, club from East-Westfalia called SC Paderborn. Although two goals from Mario Gotze, along with lone markers from Robert Lewandowski and Thomas Muller saw the Bavarian giants cruise back to their expected seat at the league summit, their victory today at the Allianz Arena is only part of the story. While their grip on first place was fleeting, the achievement of SC even making into the top flight in Germany and getting off to such a good start is a big deal in itself. With their stadium, the Benteler-Arena, only holding around 15,000 fans, a humble training ground that requires the team to get changed in the caretaker’s house, and on top of this not having a scouting network, even playing a side like Bayern in a league match is a big step for the club. Prior to this season, their first in the Bundesliga, the club was primarily known for being involved in the DFB-Pokal scandal involving the crooked referee, Robert Hoyzer. In August of 2004, SC Paderborn upset Hamburger SV 4-2 in what seemed at the time to be a massive result for the then Regionalliga Nord (Third Tier) club. It later transpired that Hoyzer had taken money from a Croatian gambling syndicate to fix the match in Paderborn’s favour. 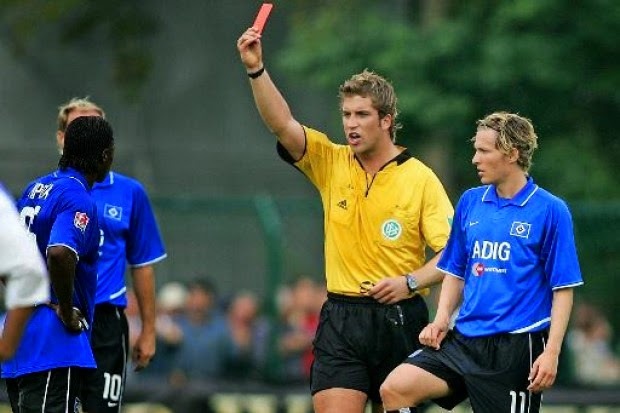 Hoyzer, who was later jailed for fixing this result and others, wrongly awarded two penalties in this notorious match and handed an unjust red card to an HSV player. Although, Paderborn was not guilty of any corruption themselves, it was an ugly incident that marred what had originally looked to have been the best result in their history. 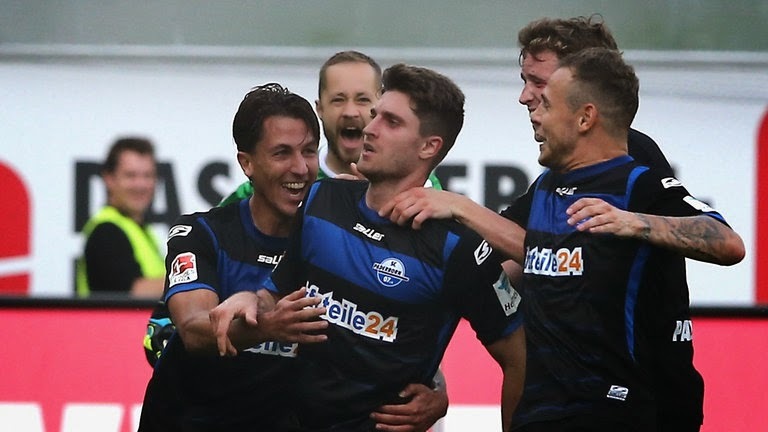 Paderborn pressed on though and after gradual improvement each year, they finally made it into the top division at the end of last season. Eventually the club would get to beat HSV legitimately as they thumped them 3-0 in their second match of the campaign. Sandwiched around draws against Mainz 05 and 1. FC Köln, this was a better start than they could have hoped for, but better was to come as they would defeat Hannover 96 in their fourth match of the campaign by a score of 2-0. That win featured an incredible 83 metre goal from former Hannover midfielder, Moritz Stoppelkamp who set the record for the longest goal in Bundesliga history when he caught Ron-Robert Zieler off his line. For Stoppelkamp, who suffered through two difficult seasons with Hannover in which he was subjected to abuse from some sections of the crowd, it was a particularly sweet moment. With their team of youngsters and journeymen, not a lot is expected of the side from SC Paderborn this season, but despite the loss today they've made a solid start so far in the league and hopefully they can keep it up.